Note – this post contains affiliate links which means I may receive a small commission if you purchase anything. More info available in FAQ. I love journals, it’s an addiction really. I buy new journals, pens, stickers, stencils… And there they sit. All too precious, too pristine to actually use. It’s crazy (and expensive), but I know I’m not alone out there. 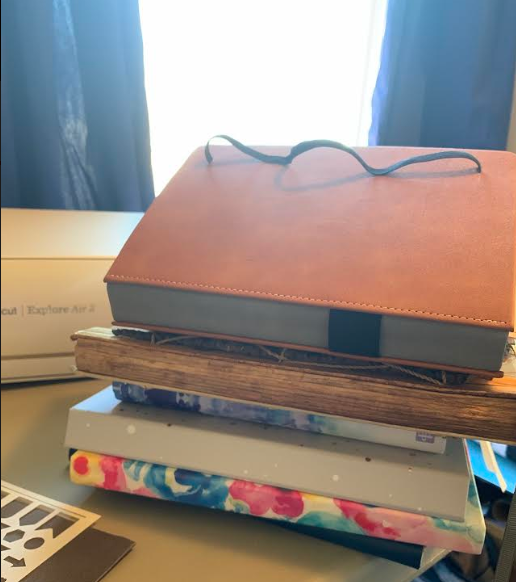 As part of my 2019 resolution, I want to get more organized and start planning my future. Both for my 9-5, my treasured blog, and my life. Matt and I are making big changes in 2019 and buying a house (!) and I desperately need to feel prepared and ready. Hence, the need to use these journals and start planning. Years ago I cam across beautifully decorated journals with the hashtag #bujo and #bulletjournal and was instantly in love. It reminded me of the journals that I would keep when I was younger but extra AF. I started researching, buying supplies… trying to figure out what it was. You may be wondering the same thing: it’s an analog system for the digital age. More than that: It’s a journal, sketchbook, planner, to-do list… EVERYTHING. 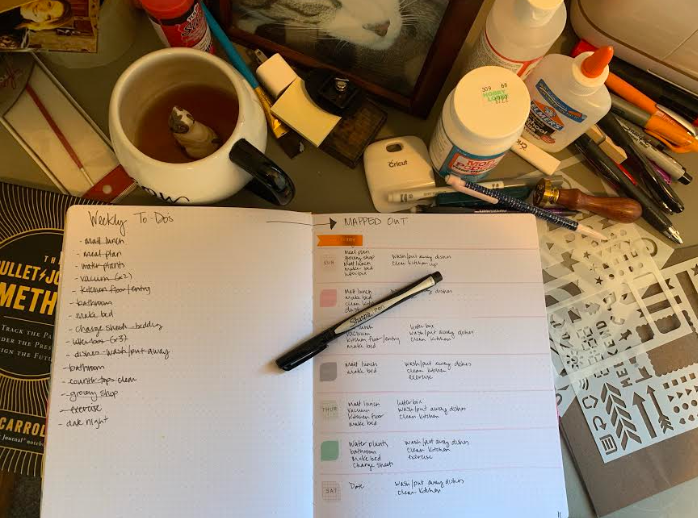 So, my quest began: I started multiple journals – but couldn’t get mine to be perfect like all of the #bujo pictures available on Instagram. Discouraged, I had given up, but my heart was broken. I needed this to be a part of my life. I can’t explain why – I just did. So I bought the book. After less than a day of reading – I finally understood. The Bullet Journal Method is more than what I thought and could be anything I wanted. 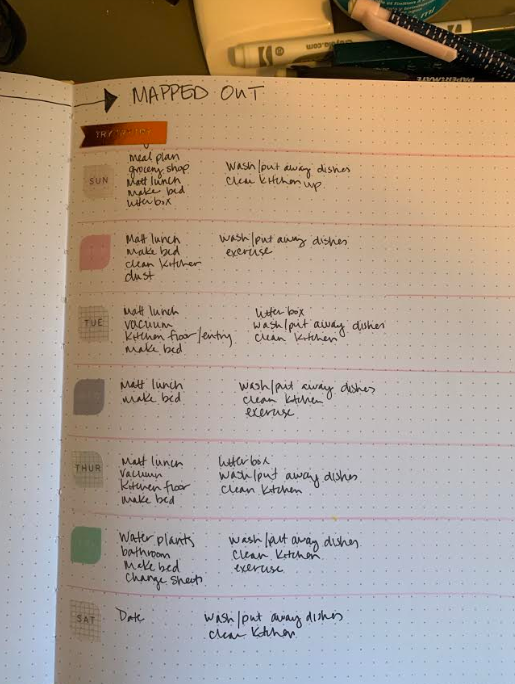 Now, I’m tracking my projects (for work and xolovekim) and planning chores as to not screw over my future self. There’s something very satisfying about crossing something off of a list. It’s also helping me with my anxiety. I brain dump everything on my mind each morning and determine if I need to focus my attention on it. I’m also keeping a gratitude log – every day I write down something I’m thankful for (currently: Matt, Home & Family, OJ, and coffee). With most things, there is a great community that shares their struggles, wins, and content. I’m a member of the Bullet Journal Junkies group on FB and have made friends and pen pals through this. This process has helped people determine their true passions, find successful work, help in emergency situations, and overcome tragedy. Honestly, I recommend trying it. You can completely customize to your needs and make this anything you want. I’ll keep you updated on how it’s going! Previous Previous post: What’s the Word, Bird?